Bacterially speaking, there are no loopholes when it comes to the popular but bogus “five second rule” about eating things off of the ground. Yet even I'd be tempted to embrace sanitary denial if feasting on delicious, expertly prepared foods that had rained down from the sky meant that I'd never have to use a pot or pan or go to the supermarket ever again. However, long before the food hits the ground in this vibrant cinematic confection based on Judith Barrett's beloved 1978 children's book, we go back in time to learn more about the man who would become the tale's veritable Santa Claus of breakfast, lunch and dinner. Like many other brainy outsiders, the path to greatness... or rather, marshmallows on sidewalks and bouncy Jell-O mini-mansions was preceded by a lot of failed experiments and personal embarrassment. To this end, we first meet Bill Hader's Flint Lockwood as a boy trying to run away from his own feet after realizing that his spray-on shoes cannot be removed. Following this inauspicious beginning, it takes a professional grade lab coat and the encouraging words of his supportive mother to cheer him on. Although his tough-minded widower father (James Caan) informs Flint Lockwood to hang up the lab coat in order to join him in the family tackle business, our unlikely scientist hero decides he isn't quite ready to conform to the sardine producing community just yet. And despite the fact that Flint's development of ratbirds and a monkey thought translator that garnered him better communication with his best primate pal and professional assistant, Steve (Neil Patrick Harris) have gone unappreciated, he powers through, more determined than ever to save his town from ruin. With the livelihood of Swallow Falls or more specifically, its sardine business jeopardized by the rest of the world's distaste for the unappetizing export, the community situated just behind the letter “A” (for Atlantic Ocean) are faced with the terrifying prospect that their entire future will be comprised of sardines. Hoping to win not just the respect of Swallow Falls but particularly that of his own distant father who speaks solely in fishing metaphors, Flint devises a plan to turn water into food. He and the rest of Swallow Falls get much more than they bargained for when Flint's invention not only works but begins to grow even mightier as the days pass, portions get larger, waste piles are concocted, and the power hungry mayor (Bruce Campbell) becomes more gluttonous than usual. While his father may not have budged, Flint does find himself taken in by a beguiling tourist in the form of amateur weather girl Sam Sparks (Anna Faris) who has arrived in Swallow Falls along with her cameraman (Benjamin Bratt). Although her bosses Al Roker and Lauren Graham deemed the location assignment not worth the time of more senior news personnel, Sam discovers that she's in precisely the right place at exactly the right time as she gets the literal and figurative scoop of a lifetime along with a budding attraction to Flint. Managing to move beyond the standard allegorical references to portions, waste, radiation and obesity to a number of other social, political, and international issues including Hurricane Katrina and irresponsible power plays, this beautifully transferred 2D version of Sony Animation's 3D effort from the Fall of 2009 works on a number of levels. Far more intellectually sophisticated than I'd imagined and with a heart as big as its largest entrees, the admirable directorial debut of Chris Miller and Phil Lord is one of those rare animated works I'd recommend showing to kids more than once across a good five or six year span as you can discuss its fascinating ingredients and their meaning as time goes by. Painstaking crafted in a span of more than three years for its roughly ninety minute running time-- although part of me wished I would've seen it in its original 3D glory--the absolutely breathtaking animation and the way the color palette changes throughout is something magical to behold for animation lovers. And recently, I learned that we may have the opportunity to view the film in 3D at home as Sony Pictures Home Entertainment plans to debut of 3D equipped Sony Bravia TVs and 3D ready Blu-ray players in the near future. 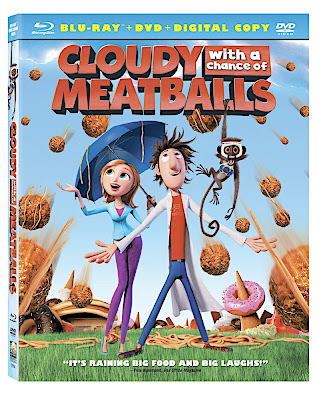 Complete with bonus features such as Sony's standard Blu-ray picture calibration Easter Egg that optimizes the presentation when you select 7669 on its main menu, Cloudy with a Chance of Meatballs also boasts BD-Live capabilities. Ensuring its appeal to audiences of all ages, the disc includes a food throwing game and a music video from iCarly star Miranda Cosgrove along with a number of behind the scenes features for film enthusiasts that walk you through Meatballs, fittingly using Robert Altman's metaphor that making a movie is like making a hamburger, which is hosted on the Blu-ray by the film's directors. However, even without the plethora of bonus features, the feature film is the one that matters. And in regard to sheer content quality, Cloudy surpasses two other big-budget 3D children's movies of 2009 including G-Force and Monsters vs. Aliens. Likewise, this fast-paced and upbeat film also increases your appetite for the next cinematic helping from How I Met Your Mother producers turned debut filmmakers Miller and Lord who prove they'll last much longer than the "five second rule" once this disc catches on in 2010.